I have previously written about my mum’s fondness for whipping up desserts. This one bears testimony to one such occasion. This goes back to when we were in school and mum was having the kitchen refurbished. Because the house was a bit of a mess, mum had a makeshift kitchen that could be used only after the builders left. Lunches and dinners were basic and functional affairs. In short, this made us a pretty glum bunch. However, one evening, mum decided to perk us all up with this dessert. It is a fairly simple fruit salad but mum had served it in hollowed out oranges. (Back then, this was quite a novelty.) In that week, dessert was totally unexpected what with regular meals being a struggle to put together. The dessert and the way it was served went down an absolute treat! To this day, I associate these orange cups with being a lovely pick me up on days when the spirits are flagging. Nothing a good dessert can’t solve, eh? Cut off about a third of the orange from the top. Cut a thin slice of the base so it can stand on a plate without rolling off. With a spoon, carefully scoop out the contents of the orange. Peel and cut into segments. 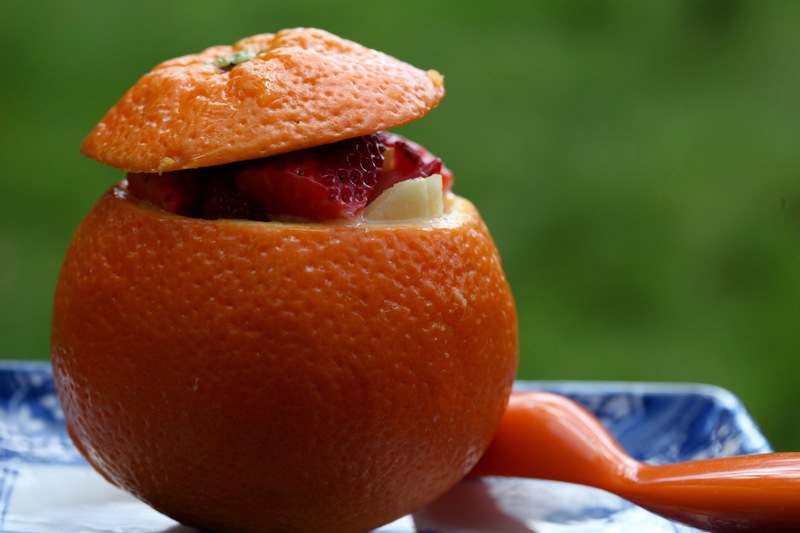 Place the orange segments in a bowl, add the bananas and apples, berries or pomegranate seeds. You can pretty much use any fruit you like. Make sure you balance a sweet flesh fruit with something crunchy- apples or pears and then another fruit to add a pop of colour – pomegranate seeds, berries etc. Now add the condensed milk and give it a good stir. Spoon the mix back into your orange cups and serve. You don’t have to be feeling blue to make these orange cups. They are a great no cook dessert that can be assembled in a jiffy. This entry was posted in A-Z 2016, Desserts and tagged #AtoZchallenge, condensed milk, epicurious, fruit salad in orange cups, Mumsnet Blogging Network, no cook dessert, orange cups, orange dessert cups, quick desserts, Yummly. Bookmark the permalink.